This article includes a list of references or other websites, but its sources remain unclear because it does not have enough inline citations. Please help to improve this article by introducing more precise citations where appropriate. Soon after the Reconquista, Spain became the first global power in the world. It led European exploration of the new world, building the large Viceroyaties in the New World at the time. Spain also created the first intercontinental trade routes across the oceans. The Spanish traded goods across the Atlantic Ocean, between Spain and its viceroyalties in the Americas. They also traded across the Pacific Ocean, between Asian-Pacific countries and Mexico throughout the Spanish treasure fleet and Manila galleons. Spanish Conquistadores conquered the Aztec, Inca, and Maya Empires together with the help of other native american tribes. They took large territories in North, South America, Asia, Africa, and Oceania. Spain made these territories into Viceroyalties until the XIX century. Spain, especially the kingdom of Castile, became much more powerful. Also, through royal marriages, the Spanish monarchs created alliances with other European powers. This allowed the Spanish Empire to gain control of many territories in Europe. With all of these territories and colonies across the world, the Spanish Empire became the greatest and richest empire in the world. For a time, the Spanish Empire was a great power in the oceans, with its experienced Navy. Its infantry known as Tercios, recruited from many countries of the Spanish monarchy, was undefeated for a century a half. Spain enjoyed a cultural golden age in the 16th and 17th centuries. Cervantes,who was the creator of the first modern novel Don Quixote, and many others such as Lope de Vega, Calderón de la Barca, Francisco de Quevedo were prominent in different branches of Literature, Architecture, Theology, Phylosophy and so on. However, eventually, the French, Portuguese, and British tried to undermine the Spanish monarchy. Starting in the second half of the 17th century, the Spanish Empire began to suffer bankruptcies, and its military began to lose battles. Finally, in the 19th century, Spain lost its last major territories overseas in the Spanish-American War. In the Mediterranean against the Ottoman Empire that threatened Europe and supported Barbary piracy in the Mediterranean. Against France, due to the Italian Wars and rival attempts to take the prosperous Italian states. Against England due to many reasons over the course of centuries, Britain became a protestant nation since Henry VIII and began a persecution of Catholics continued by his daughter Elizabeth I. The English also helped the Dutch Republic rebels. These efforts culminated in the Spanish Armada. Over the years the British tried to take rich places in the Spanish Americas, succeeding in some cases such as Jamaica and, during the Seven Years' War, Spanish Florida. Many of these different powers fought constantly, often at the same time, for long periods. They fought about both political and religious differences, and for ambition as well. The Spanish Empire slowly lost power, as it gradually lost territory to other empires. In 1648, Spain and many other powers signed the Peace of Westphalia, which ended both the Thirty Years' War and the Eighty Years' War. In 1659, the Treaty of the Pyrenees ended fighting between France and Spain. With these treaties, Spain began to lose its status as hegemonic power in Europe. In 1713, Felipe V signed the Peace of Utrecht. In this treaty, Spain gave up its territories in Italy and The Netherlands. Spain was no longer Europe's greatest power. However, it would still have an important role in European politics and a huge empire in America and the Pacific. However, during this time, Spain kept its large overseas empire, and even made it larger. The Spanish Empire fought against Britain, which was trying to take over more of America; France and the United Provinces in the New World. Spain remained a major economic power until it lost its colonies in the Americas through civil wars for some and revolutions for others. Spain kept control of two colonies in its empire in America: Cuba and Puerto Rico. It also held onto the Philippines and some preserved islands in Oceania, including the Caroline Islands (including the Palau Islands) and the Marianas (including Guam). However, when Spain lost the Spanish-American War of 1898, it lost almost all of these last territories. Spain kept control only of small islands of Oceania (not including Guam). Spain sold these islands to Germany in 1899 . Spain still kept territories in Africa. Spain controlled Morocco, Western Sahara, and Equatorial Guinea, until decolonization in the 1960s and 1970s. The last colony to gain independence was the Western Sahara, in 1975. The Spanish Empire generally means Spain's overseas provinces in the Americas, Africa, the Pacific and Europe. For instance, traditionally, territiories such as the Low Countries or Spanish Netherlands were included as they were part of the possessions of the King of Spain, governed by Spanish officials and defended by Spanish troops. Many historians use both "Habsburg" and "Spanish" when they speak of the empire of Charles V or Philip II. However, the Low Countries were effectively part of Spain during that period. Philip II's realms in 1598, showing its administrative structure during the Iberian Union, 1580-1640. The Portuguese colonial empire joined Spain and was ruled by the same monarch in "personal union", but Portugal remained a separate state. The Portuguese empire continued to be ruled from Lisbon during this period. Therefore, there was a joint Spanish-Portuguese rule for some time. These jointly run empires have sometimes been called the Spanish-Portuguese Empire. The 1469 marriage of Ferdinand II of Aragon and Isabella I of Castile created a dynastic union of Aragon and Castile. Spain became a modern state in the early modern period with the union of the Catholic Monarchs. Surrender of Granada's king in the presence of the Catholic Kings. In 1492, Spain finished a 781 years period of Reconquest with the fall of the last Moorish kingdom of Granada. that same year the Catholic monarchs financed Christopher Columbus voyage to reach India by sailing westwards. Columbus instead discoveredAmerica. That was the start of the Spanish colonization of the continent. 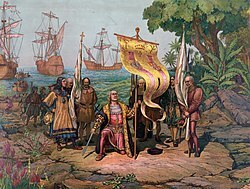 Christopher Columbus taking possession of La Española. By the Treaty of Tordesillas of 1494, the globe was divided into two hemispheres between Spain and Portugal. Therefore, Spain had the right to start colonies in all of the New World from Alaska to Cape Horn (except Brazil), as well as Asia. The Castilian Empire was the result of a period of rapid colonial expansion into the New World, as well as the Philippines and colonies in Africa: Melilla was captured by Castile in 1497 and Oran in 1509. The Spanish language and the Roman Catholic Church were brought to the Americas and to the Spanish East Indies (Federated States of Micronesia, Guam, Marianas, Palau and the Philippines) by the Spanish colonization which began in the 15th century. Together with the Portuguese empire, the Spanish empire laid the foundations of a globalised trade and culture by opening up the great trans-oceanic trade routes. The laws of the Indies regulated social, political and economic life in the Americas over centuries to protect the indigenous native people of the Americas which started a miscegenation process that other "so called" "Empires" never reached. the mix between Spaniards, Native Americans and Black people could be seen nowadays in most of the countries that became part of that Universal Catholic Spanish Monarchy also called Spanish Empire. The Spanish monarchy or the Spanish Empire never created "Colonies" but Viceroyalties or Overseas provinces. The Spanish Empire left a huge cultural, urban and architectural legacy in the Western Hemisphere. Hundreds of towns and cities in the Americas were founded during the Spanish rule. The tangible heritage includes universities, forts, cities, cathedrals, schools, hospitals, missions, government buildings and colonial residences, many of which still stand today. A number of present-day roads, canals, ports or bridges sit where Spanish engineers built them centuries ago. The oldest universities in the Americas were founded by Spanish scholars and Catholic missionaries. The Spanish Empire also left a vast cultural and linguistic legacy. With over 470 million native speakers today, Spanish is the second most spoken native language in the world, as result of the introduction of the language of Castile—Castilian, "Castellano" —from Iberia to Spanish America, later expanded by the governments of successor independent republics. Another cultural legacy of the Spanish empire overseas is the Catholic Church, which remains the main religion in the Spanish Americas. The cultural legacy is also present in the music, architecture, cuisine and fashion of much of Spanish America. The long colonial period in Spanish America resulted in a mixing of some of the peoples. Most Hispanics in the Americas have mixed European and Indigenous ancestry. While some might also have African ancestry. Brown, J. and Elliott, J. H. (1980). A palace for a king. The Buen Retiro and the Court of Philip IV. New Haven: Yale University Press. ISBN 978-0300025071. This page was last changed on 31 January 2019, at 01:16.